Yesterday we went to some friends’ house for a barbecue. To be honest, we sort of invited ourselves to said barbecue, because we went last year and Jack remembered the exact date and when he ran into my friend at the elementary school Meet & Greet, he demanded to know if we were coming to their party again this year. And so my friend, lovely person that she is, sent an e-mail the next day inviting us. And we, shameless people that we are, happily accepted. We love barbecues! Throughout the day I’d catch a glimpse of Jack here and there, running and laughing with other kids—albeit the younger ones—throwing water balloons, riding the scooters, grabbing handfuls of chips. When an afternoon thunderstorm caught us all by surprise, he danced and giggled on the driveway with everyone else, shaking water from his hair and stepping barefoot in the puddles. At one point Joe and I caught each other’s eyes and exchanged our he’s doing so well look. After dinner everyone headed out into the wet yard to try and make some s’mores in the soggy fire pit. I stood on the deck chatting with a woman about her new puppy and watched as Jack meandered close to the circle of kids, reached into the plastic bag to grab a marshmallow, and skipped away. One by one the kids straggled away from the fire, gooey s’mores in hand. And one by one, each family began to pack up and leave; it’s time to go find your sandals and say goodbye say thank you. And off they went to find damp bathing suits, still wet from earlier swimming and even more so from the sudden afternoon downpour. We sat relaxing on the deck in the waning light and watched the kids splash and jump in the brightly lit pool, swatting mosquitoes and swapping summer stories and back-to-school tales, when Jack charged up the steps towards the table. I noticed the stormy expression on his face and started to rise out of my chair to intercept him, but he launched himself at Joe instead. Our friend made a motion behind Jack’s head, indicating he’d be happy to start the fire and make another, but we shook our heads no no he will be fine it’s time we got going. We decided that was our cue to head out. Joe herded the kids out of the pool and distributed towels and shuttled them into the car, while I bustled around the house collecting hastily discarded t-shirts and towels. Chewing on the end of his blue towel, his eyes glazed with anger, he listened while our friend told him he could be the first one back to use their fire pit in the spring, the first to roast a sticky marshmallow and squeeze it between two graham crackers. Joe propelled him to the car by the arm while my friend and I exchanged the usual he’s tired he’s overwhelmed it’s a lot to handle. But still I had a pit in my stomach. The day felt ruined. After we settled the kids in bed, Joe and I sat on the couch for a while, indignant and righteous. Phrases like if we’d ever done that as kids and he needs a consequence were bandied about. We talked about taking away music, the computer, ITunes. As we headed up to bed, we agreed on a compromise: Jack needed to apologize, and he could choose if he wanted to write a letter or send a text. This morning I woke early to the sound of heavy rain. I lay next to Joe and listened to his light snoring, and thought about all the things we need to teach Jack, all the things that are not intuitive to him: regulation and empathy and regret. Contrition and forgiveness and impulse-control. Although he pictures the days as color, Jack’s mind of absolutes works in black and white: I was angry. I wanted a s’more. At this moment, these people will not give me a s’more so I NEVER WANT TO SEE THEM AGAIN. These are the words he reaches for in moments of stress and chaos and anger. I have a tendency to want to wrap autism up in sparkly paper and tie it with a license plate bow and present it to the world. See world? Isn’t autism fun and interesting and unique and extraordinary? And it is. It is all of those things. But there is also this abrupt side, a rude side, an unlikable side that doesn’t sparkle no matter what kind of wrapping paper you use. These instances force to me stretch myself. Because sitting here at my desk with my cup of coffee on this rainy morning, I badly want to let it go, to say he’s just a kid, kids are rude, they are our friends and they understand. But then an image rises unbidden to my mind, an image of 30-year old Jack barking at a colleague or a girlfriend or a neighbor, telling them he never wants to see them again over something as trivial as an unmade s’more. And so I will dig a little deeper to teach the lesson of manners and behavior, while trying to respect the confines of his spectrum disorder, the limits of his expressive language. To respect that beneath the missing graham cracker and melted chocolate are real feelings of loss, of anger, of shame. In the end, he chose to write a text. Great post! 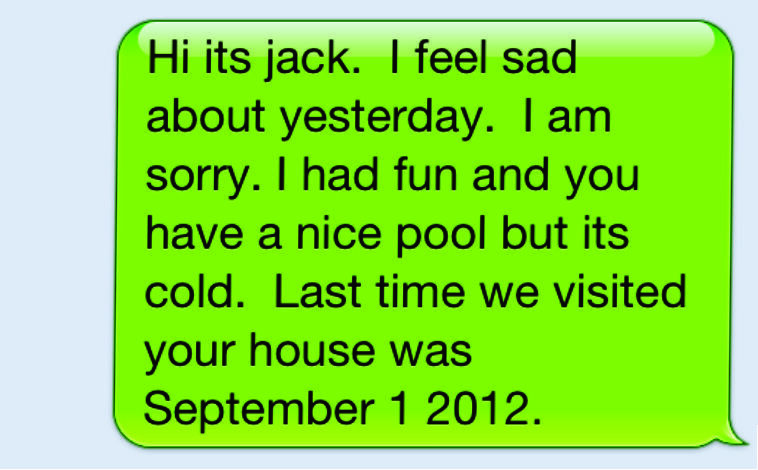 Love Jack’s text too! Another heartwarming post. Love your writing. You and Joe are doing heroic work every day that may just seem like “life” to you but the very fact that you can then write about it is huge to the rest of us. As difficult as it all is, Jack. & all of you have opened the world to acceptance , love, and the art of giving of ones self. That alone is a tremendous gift that you cannot put a price on, & will be rewarded for many times over. It’s so wonderful to see all of you interact, or to see how Joe relates to kids- it’s awesome ! What a gift to pass on to your kids!!! Just love reading your blog!! Always enjoy the way you find humor in the everyday that is life. Jack is an awesome little boy as is your family as a whole! Maybe the reason we are called to remember to let the first be last and the last be first is because – in last place – we get the best view. Perspective. We get to see all that has to take place before a victory (the text!). Autism can be sparkly and it can poke your eye out. I love how you put to words both and everything in between, friend.